Talk all you want about BNLKM here. MANILA, Philippines – Actor Gerald Anderson admitted he is not closing his doors to anyone who has been part of his past, saying he never knows what the future holds. Speaking before a pool of reporters, Anderson said he may not be communicating as much with Pop Star Princess Sarah Geronimo anymore but he still considers the singer as someone special. “Sabi ko nga sa iyo, paano magiging closed 'yan eh hindi naman natin kayang basahin ang future. Hindi na gaano, hindi na [kami] masyado [nakakapag-usap]. Oo naman, oo naman [espesyal pa rin siya],” he said. “Sino ba ang nagko-close talaga ng door? Mahirap 'yan, paano 'yan? Siyempre hindi naman natin puwedeng basahin 'yung future kung anong mangyayari,” he said. According to Anderson, he is not stopping himself for falling in love again but as of the moment, he is not really looking for love. “Lagi naman akong open sa lahat basta tamang timing at kung masaya ako at masaya siya kung sino man 'yun. Pero alam mo 'yun, hindi ko naman hinahanap o alam mo 'yun, hindi ko naman kailangan hanapin 'yun,” he said. Anderson said he just prays that the right girl would come to his life at the right time. But if given the choice, Anderson said he would like his next girlfriend to be someone not from show business. “Given a choice sana non-showbiz para alam mo 'yun maiba naman, tahimik. Pero you’ll never know, you’ll never know, hindi ko pa rin masabi,” he said. Nagsimula noong Lunes ang shooting ng On The Job, ang action movie nina Piolo Pascual at Gerald Anderson. Si Erik Matti ang direktor ng bagong project ng Star Cinema. 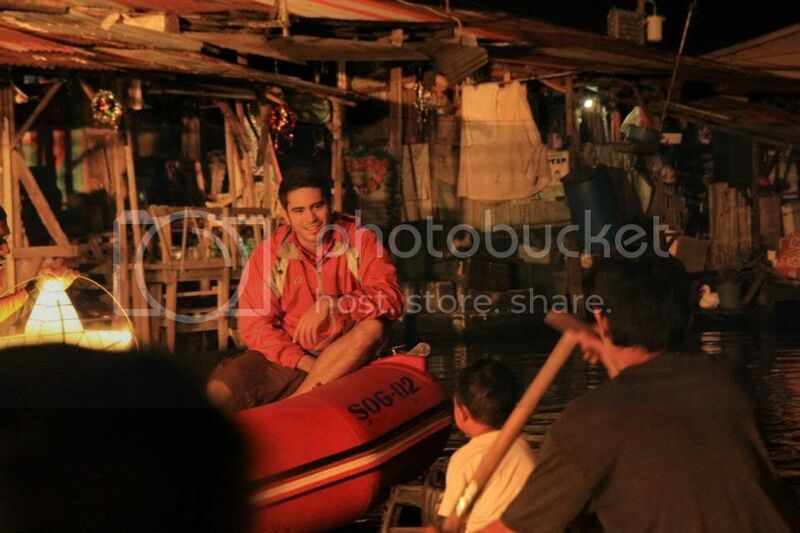 Nagpagupit si Gerald Anderson para sa role niya sa On The Job. Tatapusin ni Gerald ang pelikula bago niya umpisahan ang taping ng Bukas Na Lang Kita Mamahalin, ang primetime show niya sa ABS-CBN. The Diamond Star Maricel Soriano is back in the Kapamilya network after signing contract with ABS-CBN early afternoon of November 26. Included in her contract is her upcoming teleserye with Gerald Anderson, Cristine Reyes, Rayver Cruz, Dina Bonnevie, TonTon Guttierez, and Diana Zubiri entitled Bukas Na Lang Kita Mamahalin. The family drama is targeted to be released by 2013 to celebrate her return as Kapamilya actress. Maricel Soriano is very happy to return to the Kapamilya network where her last teleserye was Florinda, one of the Susan Roses Collections that aired on Primetime Bida last 2009. Meanwhile, her teleserye Bukas Na Lang Kita Mamahalin is now on the production stage where they already started and it was directed by Jerome Pobocan Chavez and Tots Mariscal Sanchez. Present at the contract signing were Charo Santos-Concio, Cory Vidades, Laurenti Dyogi and Deo Edrinal. It's home sweet home for the “Diamond Star” Maricel Soriano, who has officially returned to the Kapamilya network. The actress signed her contract with ABS-CBN on Monday with network bosses Charo Santos-Concio, Cory Vidanes and Laurenti Dyogi. Soriano said she also can't wait to work with Cristine Reyes, Gerald Anderson and Rayver Cruz. “I’m very blessed with them. Alam kong laki sila sa tatay ko si Mister M (Johnny Manahan), alam ko na magaling ‘yung training na ginawa sa kanila, naalagaan sila,” she said. “Sobrang saya ko kasi ang warm ng welcome nila sa ‘kin at naramdaman ko ‘yun kaya happy na happy ako,” she added.